Since summer 2016 I have been GMing a Numenera campaign. Originally planned as oneshot, I turned it into a campaign because we had so much fun. I came up with a crazy plot idea (think invasion of the body snatchers), which might be a touch too crazy for my players to follow. We started out with three players, and now there’s four, all tier 2. During the campaign I also use published adventures that I place within my plot. On Sunday we continued the adventure Vortex. This was the launch adventure that Monte Cook Games used at Gencon 2013 when Numenera was first presented. The adventure can be split into two separate parts that you can play independent of each other. You can stop after part 1 as the second part is not ideal for tier 1 characters. As my group is tier 2, I went ahead and ran both parts. Warning, spoiler alert from this point onwards. In part 1, the group went hunting for a mysterious building, the Narthex. It teleports around the world, only ever staying a couple days, and inside it’s Tardis-style, much much bigger. Inside, they found a bunch of cultists that actually kidnap people to increase the site of their cult. To stop this, the group infiltrated the cult, got rid of the insane leader and kicked out his second-in-command. Shortly after those events, the group heard a mysterious voice, inviting them over to where ever it was. The voice led the group to a magical well, strange numenera grabbed the party and dunked them in the well. This covered them up in a strange armor. The voice asked the group to enter the Vortex, a weird glowing portal. 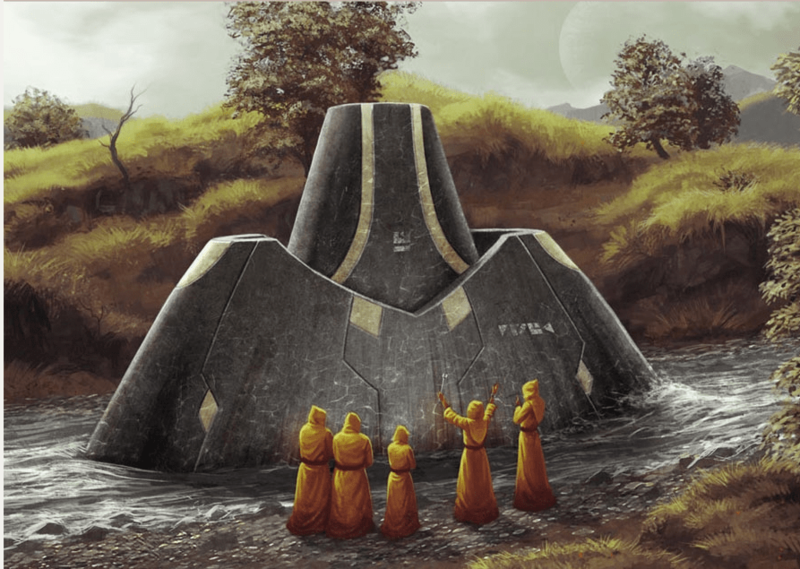 The cultists worship the Vortex as the source of all life. Mysterious building plus cultists, check! In the Sunday session, the group did actually enter the Vortex. They ended up in a room made of green synth that showed signs of destruction, and was extremely warm, despite the armor. The ground was trembling, in the distance material was groaning. The Radiant Citadel, as the voice had called it, seemed doomed. The voice invited the group to join it in the communication room, to talk to the voice. As the group went down a curved hallway, Tidus looked out of one of the windows. The windows were partly shielded, but not all of them. Looking outside, Tidus stared into incredibly bright light, blinding him temporarily. The group found a control mechanism to darken the windows completely. Sam and Lemy were able to operate it due to their extensive numenera knowledge. Sam didn’t stop, and caused a loss of gravity, with the group floating around until Lemy was able to reverse it. Upon further exploration, the group heard heavy steps. Apparently they had triggered an alarm. First they were able to evade the guard mechanism, but not permanently. In one of the storerooms, they engaged in combat against a metallic, armored guard with a glowing sword of energy and a shield. Only the heaviest of attacks, distraction and teamwork allowed the group to defeat it. Sam was able to remove the sword from the armor, and Ophelia now uses this broadsword of fire, a powerful artifact. The group rushed through the citadel that was collapsing faster now. They avoid falling into tears or being sucked outside the building. Eventually they found the communication room where the voice turned out to be a creature of energy, Aerridomos. This creature asked the group to repair the citadel, or if that was impossible to send him and his fellow energy creatures into exile. The citadel turned out to be a station in the corona of the sun, harvesting energy, for an unknown purpose. In return for their assistance the creature offered an override code for the controls of the Narthex, the teleporting building on the other side of the Vortex. The group was very keen on such a code. The group found a locked room. Ophelia used her ability of shifting phase to walk into this room. She was able to tell the others that a strange ball of light was floating in there. The Numenera experts figured out a way to open the door. Pooling all his knowledge, Lemy figured out that the floating ball allows the creation and modification of things. Risking his life, he used the ball of light to repair the citadel completely. With the collapse of the station turned away, the group explored the rest of the citadel in peace, finding a couple cyphers and oddities. Aerridomos stuck with his promise and provided the group with a transparent slip of synth, for the override of the Narthex. The group decided to stay the night, so that Lemy would be able to return to use the ball of light again. The possibilities seemed limitless! One of the many items of their to-do-list were crab-eyes for Boregal, their petrified brain companion. After a night’s rest, the group had an urgent problem: toilet facilities required! Only Lemy would have been fine peeing in an empty room, the others wanted facilities. Lemy used the ball of light again, to create two toilets and a rest area for the group. However, it seemed that using this artifact will not be feasible forever, as it made Lemy’s ears bleed, and the ball of light went dim. Was the artifact depleted? As the group wanted to wait and see if the ball of light would receive energy, they decided to walk through the Vortex again. Upon their return, two cultists were praying in the Vortex room. 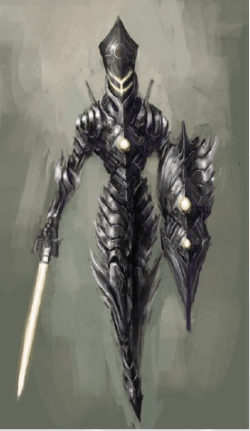 The cultists took the armored party to be god-like beings from the Vortex, and called them the Vortexlings. The rest of the cult joined to show their worship for the new gods of the Vortex, which was the end of our session. That was pretty fun! I wasn’t wholly satisfied, but then I never am. It didn’t feel as threatening as I wanted it to feel like. I created tears in the citadel, Sam was almost sucked into the sun, and yet. Just not as dangerous as I wanted it to be. The grand finale of the collapsing citadel with the party rushing to the exit never happened, due to the two Numenera geniuses in the party. The fight against the Radiant Knight was also not as exciting as hoped. Due to the heavy armor, he just didn’t really do any damage. I should have tweaked that. At least the group seemed to feel he was very threatening! The party used a wishing well to repair the station, a level 8 Numenera. I had assumed they would not manage the roll, but I was so wrong. 2 effort, teamwork, and a book as asset, and the difficulty was down to 4. Lemy failed a couple of the rolls, but he used XP multiple times for re-rolls. Maybe I should limit the amount of times you can re-roll. However, I am finding that Numenera characters level really quickly. Just about every adventure they are able to improve their characters permanently. This means I am quite happy that players also use XP to re-roll. I was happy to see that the players are ready to use XP and pools a lot. When we started playing, people were super-careful with their pools and effort, and now they’re not. The party is now able to control the Narthex. Until now, it jumped to a random location every three days. The group can’t decide freely where the building will jump to now, but they have a map of fixed points that they can steer the building to. It’s powerful, but I really like this! I want the players to experience the wonders of the Ninth World, as written in the setting, Ninth World Guidebook and other sources. Maybe even Sagus Cliffs from the new Numenera video game. So many possibilities. I like world exploration, hoping my players like it too. Looking forward to our next session in April. I think the players will probably turn back to the plot now, now that they have a traveling building they can control. On their search for an artifact to stop the impending end of the world, the group will have to travel to Matheunis, the Cold Desert.